What camp should I send my wrestler to? What offseason training program are you participating in? Do you think a club would help my child become successful? What do I need to do to become a state champion? How do I know what the best camp is for the money? When is the right age to go to camp? How do I really know what each camp offers? If you are a wrestler, or a parent of a wrestler, those thoughts have crossed your mind. That’s where The Ultimate Guide to Wrestling Camps can help you. Why? Because the book answers those questions . With interviews, comments, quotes and information from over 40 of the most informed and educated people involved in the sport of wrestling, this book is not only an educational resource for wrestlers, it’s a valuable tool for parents who are trying to learn more about the training opportunities available for their son or daughter (in many cases there are multiple children involved). It provides stories, tips and information for wrestlers of all ages, whether it’s the young wrestler just starting his or her career, the kid who wants to figure out how to make the starting lineup for the high school team or the wrestler who hopes to compete at the college level – it’s covered in this book. 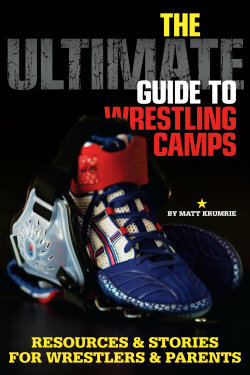 But The Ultimate Guide to Wrestling Camps is more than just a resource about camps. It provides information on club wrestling, the combination of MMA and wrestling, nutrition tips, training tips, camp checklists, case studies, wrestling stories…and more. Matt Krumrie is the former editor of TheWrestlingMall.com and has contributed to W.I.N Magazine, The Guillotine and Intermatwrestle.com. He has been a guest on TakedownRadio.com and covered numerous NCAA Division I wrestling championships. As a sports writer, Krumrie has had articles published in over 50 newspapers, magazines and web sites.